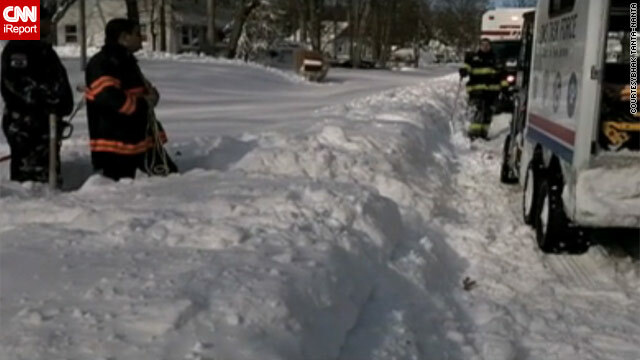 The epic snowstorm that hit the Northeast last week was matched with an epic effort from first responders, including a group of firefighters in Neptune, New Jersey, population about 5,100. The Hamilton Fire Company crew that worked the night after Christmas were all volunteers, said iReporter Bhak Tanta-Nanta, a firefighter who filmed a 67-hour shift that spanned three days. That fire crew and other first responders had to deal with abandoned vehicles, waist-deep snow and residents upset that snow on their streets hadn't been plowed fast enough. – A house fire that the crew had to trek to from another street. Did firefighters have issues with the waterhose freezing? “We had issues getting to the house,” Tanta-Nanta said. – Thirty inches of snow in some areas. – Six hours of sleep over a three-day period. Neighbors assisted first responders, digging an almost two-block-long trench so they could pull an injured elderly man from his home. Firefighters had problems getting to the man’s home. “We could not reach the house but neighbors had been walking to the street [to flag down EMS crews], so they had already made a little path,” Tanta-Nanta said. At one point, neighbors and children helped dig trenches with the firefighters, Tanta-Nanta said. 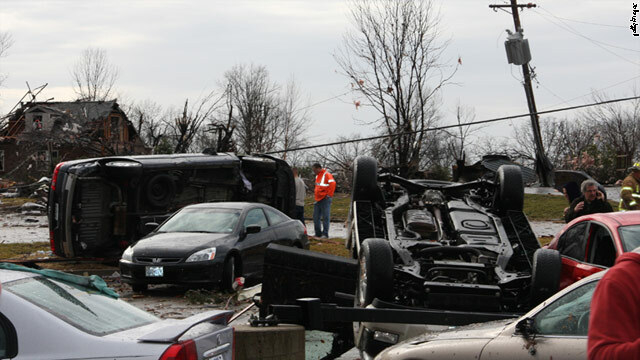 One day after a violent storm system roared through parts of the nation's midsection, spawning tornadoes in several cities in Missouri and Arkansas, freezing temperatures Saturday threatened to compound the plight of victims left homeless due to the weather. Temperatures in Sunset Hills, Missouri, dropped Saturday to 16 degrees Fahrenheit – with a wind chill of 7 degrees below zero, according to the National Weather Service. Temperatures dipped into the 20s in parts of Mississippi, where the storm had knocked out power to nearly 20,000 homes. Seven people died and dozens were hurt Friday in a storm system that stretched more than 1,000 miles from the Northern Plains down to the mid-Mississippi Valley. On Saturday, Missouri Gov. Jay Nixon toured a neighborhood in Sunset Hills, a St. Louis suburb. "Bottom line [is] significant property loss," he said. The tornado that hit Sunset Hills will be rated an EF3, the National Weather Service said. An EF3 twister has winds between 136 – 165 mph, according to the weather service. A family of seven lost their home in north St. Louis, CNN affiliate KMOV reported. William Gibbs told KMOV that his daughter told him that there would be a tornado. "I took it for granted," Gibbs told KMOV. "I'm thanking God that we're all safe but, I don't know where we go from here," he said. Latasha Stuhlman told CNN affiliate KMOV that her home has been condemned after the storm hit her neighborhood. The Stuhlmans will sleep in a hotel with other families. The St. Louis-area Red Cross said in a news release that it had provided assistance to about 60 people Friday and expected that number to grow following a damage assessment. You can contact the St. Louis-area Red Cross at (314) 516-2800. 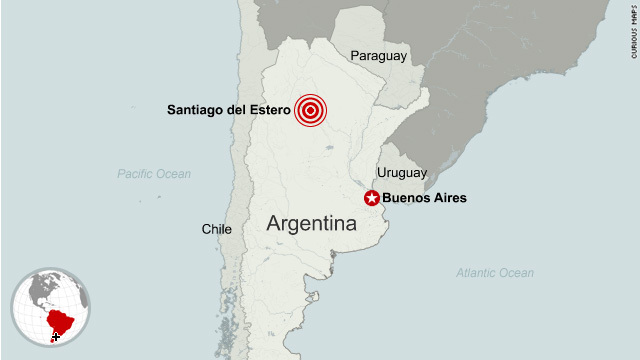 A preliminary magnitude 6.9 earthquake struck the Santiago Del Estero region of northern Argentina early Saturday, according to the U.S. Geological Survey. The earthquake struck 350 miles deep, according to the USGS report. There were no immediate reports of damage or injuries.